Exchange-traded funds have been growing at a rapid pace since the launch of the first ETF nearly 20 years ago. Today, the global ETF market boasts assets worth more than $1.7 trillion and the pace does not seem to be slowing down. According to last year’s Greenwich study, 40% of institutional investors plan to increase their ETF allocation in the next 12 months. But how are the most sophisticated investors utilising these seemingly retail investment tools? 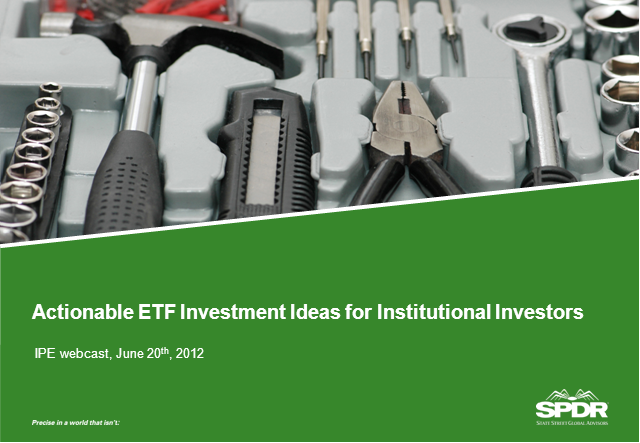 Join experts from SPDR® ETFs, the exchange traded funds (ETF) platform of State Street Global Advisors (SSgA) to hear how institutional investors are currently using ETFs, which asset classes they are accessing with ETFs, and why ETFs are an attractive option for index exposure over other vehicles. The discussion will also address common misconceptions of ETFs. • Using ETFs for strategic/tactical asset allocation, transition management, cash equitisation, rebalancing portfolios and liquidity management. • Asset classes to consider accessing with ETFs. • Comparing ETFs, futures and swaps. • Addressing common misconceptions of ETFs.